Aces Copiers : Don't gamble with another dealer; You're always a winner with Aces! At ACES, we understand the office environment. At this eco-friendly point in our nation's history, professional paper products still serve a crucial role in today's business climate. Your need is our priority. 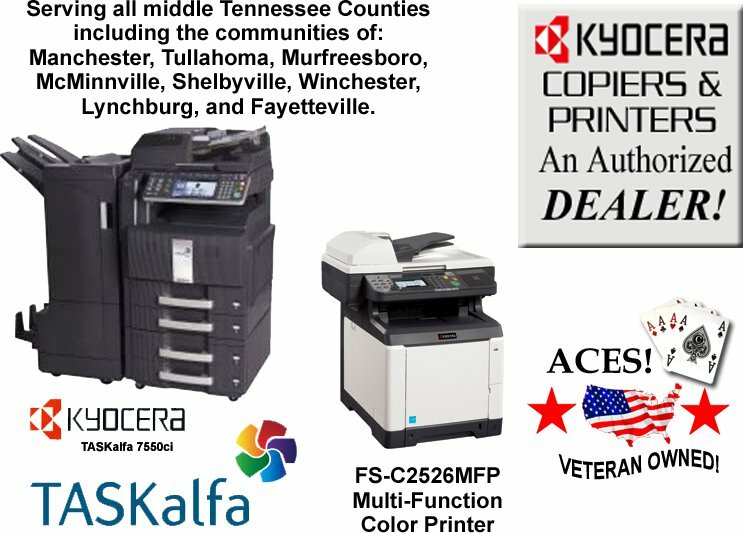 Copiers, printers, and copier products from KYOCERA are are adaptable to serve from small business to large corporate requirements. Before considering your commercial copier purchase, let us assist in helping you to project financial considerations like up-front costs, service rates, plus toner, paper, and electricity expenses. We are co-owners Craig Abbott and Bobby Elliott. We bring over 50 years of copier and office document experience to your business. We are real people whom you can rely on for service when you need it. We get to know you and your business and feel a professional responsibility for what you need to accomplish. Your bottom line in effect becomes our main concern. When you call for sales or service, you'll speak directly with either of us - every time. Our business is not so big and diluted like other corporations that can often become almost faceless when you need help. Through regular maintenance and for service you'll get to know and count on us! We match need to product, all the while mindful of your expenses. To over-sell would be an injustice, to under-sell would be irresponsible. The perfect situation is always win-win! Please browse our site! We have direct links to KYOCERA for product specifications and other important details. You will find service information and how to quickly contact us when your copier is "on the fritz." Best of all, you now have a way to anonymously report your old and crummy copier that you fight with every day. Don't work with the deck stacked against you - report that hated copier to Aces. Fill out a very short - and confidential - form and we'll soon investigate the best way to bring your office an effective repair or replacement without ever revealing, or even knowing, your name! Don't gamble with your business - Call ACES! ACES provides a comprehensive supply of printer and toner cartridges, We offer cartridges for every brand, no matter how rare! We also deliver free of charge! Best of all, we are certain that you will not find replacement cartridges anywhere for lower prices. Call now to have them delivered anywhere in our service area - FREE! Considering high fuel prices you might spend more looking for the cartridge than the actual cost of it! Take advantage of the FREE service today. Call (931) 247-8706 or (931) 728-4948. You may also choose to order your cartridge online by clicking the Cartridge Sales image above.